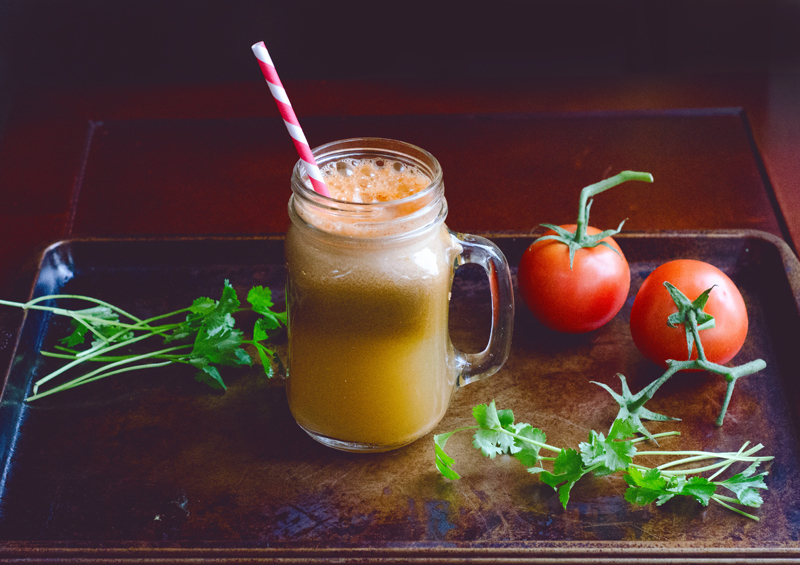 Detoxing with various beverages is a great way to help give your body the nutrients it’s really craving, and can give your digestive system a break from having to break down and digest food. The liver is the most important detoxifying organ in the body, so it only makes sense to drink fruits and vegetables to help it function at its best. Here is a list of detox drink recipes that can be incorporated into any detox program you’re following, or just enjoyed for their health benefits. The matcha in the title means that you’re getting the real deal green tea that is used in Japanese tea ceremonies. 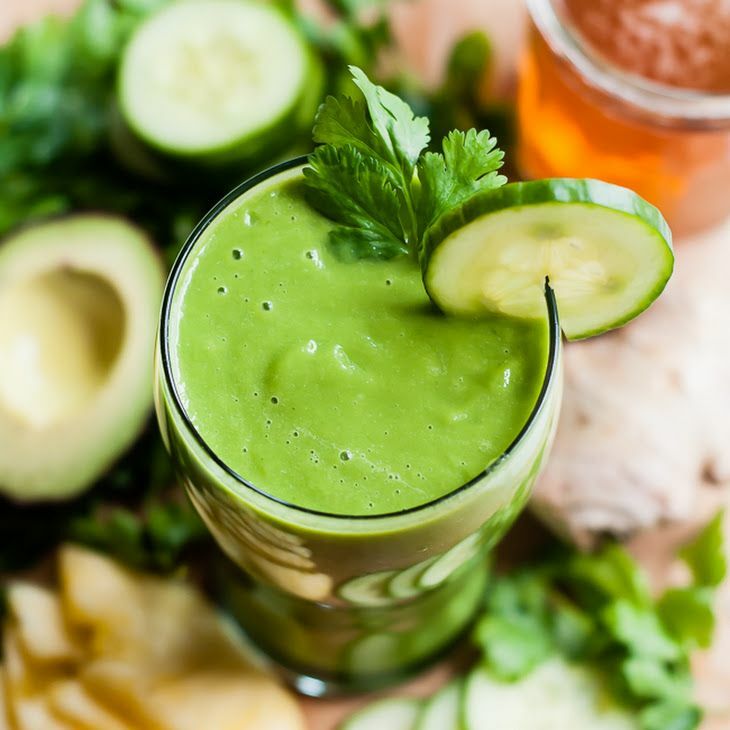 Talk about a big boost of antioxidants, this smoothie can’t help but be green because of the tea. The pineapple is a nice touch, and the mango really lends a hand with additional vitamins and nutrients that are tough to find in other fruit choices. You’re left with a tropical-tasting blast of antioxidants that will be of great help to your body. f you’re using fresh fruit, chop it all up then toss it all in a blender! Done! Pomegranate is surging and popularity recently, and it’s not surprising to see why. It’s a great detox food, containing more antioxidants than green tea. Green tea has pretty much set the benchmark as far as antioxidants go, so this is pretty impressive. There’s also pineapple in this, so you’re going to get some sweetness and the extra vitamins it contains. The lemon will help rev up your metabolism, and balance out the sweet flavors. In a blender combine everything except pomegranate juice and blend together to form a smooth consistency and strain through the strainer and set aside. To pineapple lemon ginger mixtures mix in pomegranate juice. If you loathe the idea of eating your greens, this recipe is designed to get you to like them again. Since you won’t have to chew them up, just drink them down, you can get all of your greens in just a few seconds. But the other part of this recipe is that they want you to enjoy your greens, so they’ve added some lemon to help the greens taste better. With cucumber, spinach, collards you’re getting plenty of phytonutrients, as well as hydration. Your body will thank you, and several organs will benefit from this concoction. Organifi Green Juice is the most nutrient dense superfood mix that I’ve ever tasted. From detoxifying, to balancing hormones, to antioxidant support, the KSM-66 Ashwagandha that we use ALONE is a miracle of a superfood. The Moringa mixed in will cleanse and purify your kidneys, helping your body dispose of fat instead of storing it. Chlorella is another powerful ingredient in Organifi. It’s actually used in Japan as frequently as Americans use Vitamin C! It binds to heavy toxic metals and ushers them out of the body and organs. Mint stimulates digestive enzymes, Spirulina improves memory and treats ADHD. Turmeric is a natural pain reliever and anti-inflammatory, which I believe treats the root cause of weight gain. Wheatgrass and Matcha Green Tea are high in chlorophyll and antioxidants like EGCG, which are essential in cancer prevention (often caused by build up of toxins.) With Lemon, Beet Juice, and Coconut water, Organifi Green Juice is a mega-nutrient dense detoxifying super drink. And guess what the best part is? It’s absolutely delicious! Sometimes it’s alright to keep things simple, especially when you’re detoxing. This recipe is basically water that has different cleansing fruits and vegetables soaking in it. The nutritional aspects of these ingredients will be absorbed by the water, and it’s recommended to let this sit overnight for best results. The nice thing is that you can keep refilling the pitcher so you get the most value for your money and use up as much of the ingredients as possible. I make mine the night before so the flavour from the ingredients is stronger. Continue to refill with water for throughout the day. 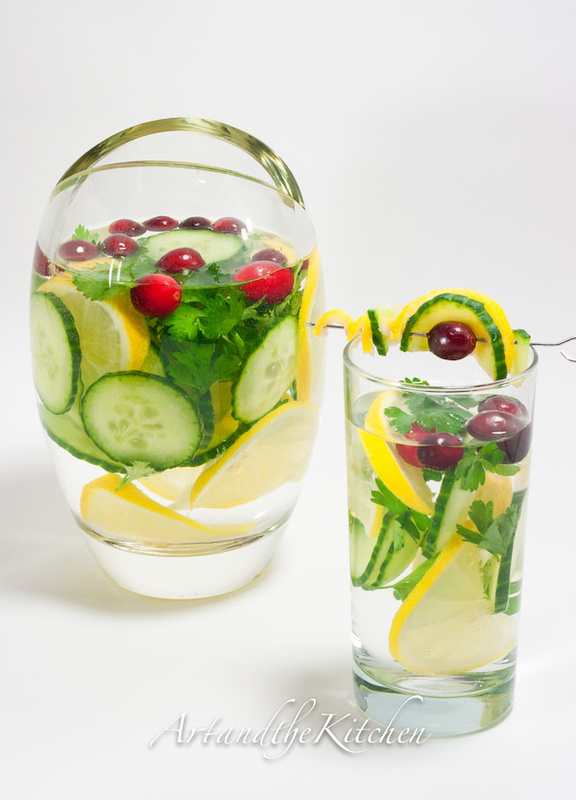 When it comes to detoxing the body one of the first steps that is often recommended is to hydrate the body. Most Americans are dehydrated to some extent due not only to the lack of water intake, but also the drinking of dehydrating beverages like coffee and soda. Here’s a way to introduce hydration back into the equation, boosting metabolism, flushing toxins, and providing nutrients from ingredients like strawberries and apples. Keep it organic for better detoxifying effects. In a juicer, juice each ingredient in order. Pour into two glasses with ice. Add a couple sprigs of mint for a garnish. Enjoy! Any time you mix kale with pomegranate you are doing a huge service to your body and your well-being. The antioxidants in the pomegranate will help battle free radicals, and the kale provides fiber, protein, and phytochemicals. Additional antioxidants are found in cranberries, with a pear added for sweetness. The use of mint gives this a fresh taste, and they say you can add stevia, an all-natural sweetener until it tastes good to you. Place ingredients in juicer one at a time (I reserved the pomegranate seeds for the end, as their high fiber content pushes out anything else left in the juicer mechanism), strain if desired, and serve immediately. Makes 2 servings. OK, so it doesn’t really look like a rainbow once you’re finished making this, but the vegetable lineup before you juice them definitely reads like the colors of the rainbow. You’ve got red from tomatoes and peppers, orange from carrots, yellow from lemons, green from celery, parsley, romaine, and cilantro. All that’s missing is something blue, but not too many foods fit that bill. 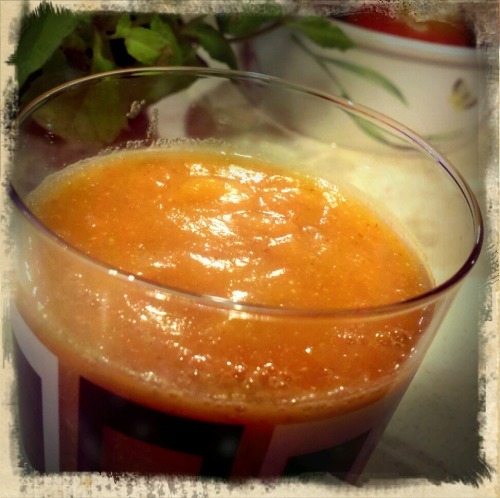 This is a fantastic way to group your daily allowance of veggies into one yummy juice. Juice all of your lovely veggies. Give your juice a good stir. Put it in mason jars. Drink it as soon as possible, not waiting longer than 48 hours! Simple, simple. Most of the time smoothies don’t contain tea in them, but they’ve decided to use the granddaddy of all teas, green tea. This means you’re going to get plenty of detoxification going due to the antioxidants it contains, but you’ll also help speed up your metabolism because of the EGCG. The addition of citrus fruits only adds to the vitamins you’re getting, and makes it taste better. They’ve even snuck in a banana for potassium and fiber, and Greek yogurt for protein and a smooth texture. Place ingredients into a high speed blender and blend until a smooth consistency is achieved. Turmeric is not only a metabolism boosting spice, it also contains detoxifying power, helping the liver break down toxic chemicals. Ginger also adds cleansing qualities, and organic lemon juice with cayenne pepper is reminiscent of the detox lemonade diet. The overall effect is you’re getting a powerful blend of spices with just enough sweetness added to make it taste good and keep you drinking it. The boiling makes sure that all of the ingredients get equally dispersed. Bring 2 cups of water to a boil and while letting it heat up, put the rest of the ingredients (and the other 2 cups of water) in your largest favorite tea cup or jar. Pour on Hot Water & let sit as long as you like or until you feel that the ingredients have properly mixed & dissolved. Drink & enjoy the benefits! If you don’t like to eat spinach, but know you should because of all of its impressive health benefits, this is a pretty good compromise. You’re using a copious amount of it, and adding in other ingredients like cucumbers and ginger to make sure that you get a well-rounded experience. The spice comes from the ginger, so if you’re not a fan, you can take it out but then you’re missing out on its cleansing effect. Overall this is a refreshing beverage that you can use to detox, or just as a pick-me-up when you need it. Place all ingredients into a high-powered blender. Blend until everything is smooth and frothy. Drink immediately, as this “juice” will separate. Grapefruit juice all by itself makes for a good detoxifying drink, so when you start doctoring it up with other superfoods you know you’ve got a winner in the making. Here they’ve used avocado, so you’re getting the benefits it brings, like healthy fat and potassium. There’s also banana, strawberry, and orange juice, so you’ve got plenty of vitamins and minerals to help your body get clean. A bit of maple syrup is optional, if you find it needs a sweetener you may want to use honey or stevia to keep it totally healthy. 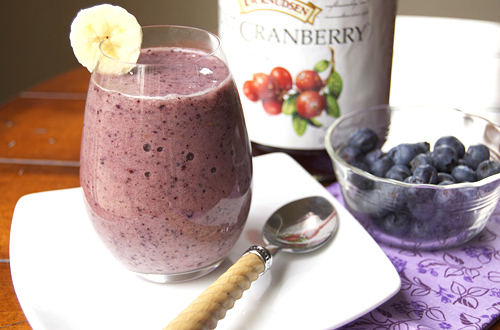 Blueberries do the heavy lifting on this detox smoothie, with all of their antioxidant power. Bananas lend their support, adding fiber and potassium to the mix, and there’s also cranberry juice which has a cleansing effect, and can even be used to treat a urinary tract infection. Overall this is a nice combination of flavors, as well as a mixture of three superfoods in their own right into one easy-to-drink smoothie. Good for a morning drink, or any time of the day if you’re trying to eat detoxifying foods. Only four ingredients in this recipe means that they’re keeping it very wholesome, and only foods that are known to help cleanse the body have been invited to the exclusive party. Surprise! There’s no oranges here. They’re referring to the color of the drink caused by the carrots. 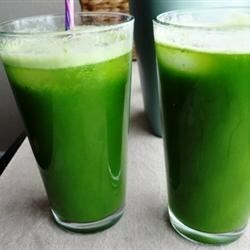 You’re also getting the powerful benefits that are in celery, the goodness of apples, and some lime for a nice citrus twist that helps to pull this drink together. Process the apples, carrots, celery and lime through a juicer. Serve immediately over ice. Anytime they add avocado to the mix you know you’re going to get a smooth texture, healthy fat, and a soft flavor. They also include cucumber for its hydration properties so you’ll be able to flush out more toxins. They even show you how to keep this recipe vegan, which also keeps it dairy free, and also makes it Paleo friendly. You might not notice it once it’s finished, but it contains plenty of healthy nuts, so you get the benefits of nuts, without having to crunch them up. Flax seed gives you an omega-3 surprise so you’ve got a well-rounded detox smoothie here. When we first heard of the idea of drinking a pizza, we were a little skeptical. But the more we thought about it, it makes sense. Wrapping your mind around the idea of helping the body with the flavors of pizza is step one. But once you see the ingredient listing you’ll see that it’s a superfood powerplay here. The lycopene from the tomatoes is the biggest factor, but your body gets carotenoids from the peppers. There’s also enough kale used in this to supply your body with plenty of toxin-fighting agents. Juice everything except the cashews. Pour juice into blender with cashews, blend. They refer to this as a tea, but it might be unlike other teas you’ve tried, since you don’t steep it from a tea bag. It’s made from herbs and seeds that you boil together and then drink. The use of cumin, coriander, and fennel mean that your body is going to be able to filter out harmful elements while being replenished with foods it can tolerate much better. They also include a recipe for a more traditional fruit and veggie smoothie so you’re really covered as far as your detox efforts go. Place all ingredients in a french press, let stand 5 minutes before plunging. Refill press one more time with boiling water. Try to drink a total of two quarts in a day. Alternatively, simmer all ingredients together for 5 minutes in a pot. Strain, before drinking. Ginger is a great healing food, so anytime you feel that your body needs to calm itself down, you can turn to it for support. It helps the other foods around it get more properly absorbed by the body. That’s why you’ll see it several times in this list. It amplifies all of the health benefits from the other superfoods. Here’s they’ve mixed it with mango, not just for the amazing flavor, but for the alkalizing effect it has on the body. If you’ve been eating a lot of acidic foods it’s high time to introduce more alkaline selections. Blend all ingredients in a high speed blender until completely incorporated. The liver is the crux to your detoxing program, so anything that makes it happy is going to provide you with the results you seek. Here they’ve singled out the liver in this juice, and are sending massive amounts of vitamins and minerals that are specifically geared towards helping it function optimally. Item one on the list is beets, and if you haven’t looked into this amazing superfood you should, it’s worth the read and it’s worth going out of your way to make sure you’re getting it. The beets alone would have been enough to call this a detox drink, but they went and added a lot of other antioxidant-rich foods, including green tea. You’re also benefiting from the anti-aging and cancer-preventing properties of the carrot. The grapes also contain Vitamin C so you’ll be helping your immune system, making this a great drink for the cold winter months when everyone is getting the flu around you. They also contain resveratrol, an antioxidant that can help prevent heart disease. Steam carrot and beet until just tender, about 10-15 minutes, depending on how thick your slices are. Let cool. Here’s a way to make a simple smoothie that has massive detox potential. Starting with a base of spinach is always a good step, and they’ve made it taste good by adding pineapple juice and lemon. There’s also ginger included, which will act as a sort of catalyst for the other ingredients to work their magic. Your body will be able to better utilize the nutrients that spinach contains, maximizing how good you feel, and how many toxins you’re able to purge. Pour the juice into the blender. Add the lemon juice (minus the seeds). 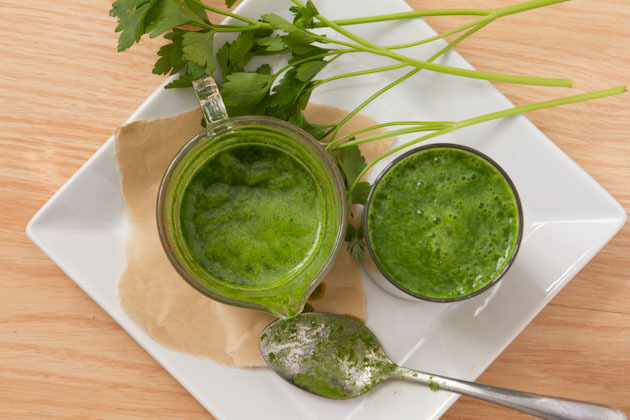 Grab a handful of fresh spinach leaves and throw them into the blender. Peel the fresh ginger and grate it finely and into the blender it goes as well. Blend till liquefied and green. 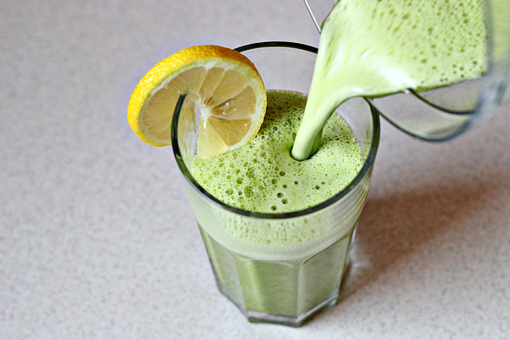 Remember the wheat grass craze that hit the health food scene years ago? It’s pretty much died down since then, but the fact remains that it’s super good for you and has tons of detox features to it. Here they’re mixing it with spinach, can’t go wrong there, and they’ve upped the taste factor by adding some stevia as well as almond butter and coconut water. They’ve kept the fruit to a minimum to avoid added carbohydrates. Pour milk into the blender. Now add spinach and remaining ingredients in that order. Blend on high until really smooth. You can add more almond milk or ice if necessary. Pour into one large glass or divide into two substantial servings. If you haven’t discovered flax seeds, here’s a good place to start. They provide omega-3s to help fight inflammation, and can help regulate your digestion so you’re able to be more regular, which is a huge boon to your detoxification plan. 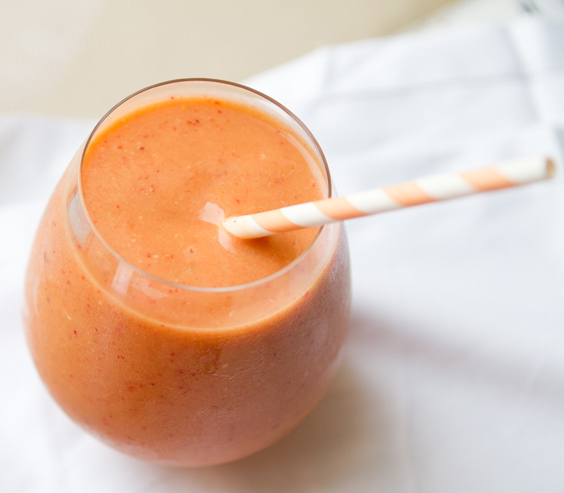 Apples, carrots, and ginger root lend a hand to make this a pretty potent cocktail as far as cleaning you out and giving you some nice nutrients to replace the harmful substances you’ll hopefully be getting rid of. Honey Drink with Ginger and Lemon – This is great because it only makes one serving, so if you’re in a rush and flying solo you can whip this up for a nice hot drink that will help clean your digestive tract and prepare it for the day ahead. The honey, ginger, and lemon juice all work together in harmony with their wholesome properties, making this a drink that you can have whenever you are on a detox kick, or when you’re trying to follow a specific plan to help take care of the toxins in the body. 1 teaspoon of whole flax seeds. 1 red apple, peeled and sliced. 8 snack-sized peeled carrots (or 2 normal carrots, peeled and chopped). Just one teaspoon of flaxseed added to one cup of lukewarm water will release the slippery mucilage necessary to gently shed toxins through a natural laxative process. The seeds need to soak for a half hour to begin this process and once in the system, you will experience their glorious efforts 20-40 minutes later. You will know that you have successfully created flaxseed water when the water above the seeds appears to have a film and the seeds have become gooey. Throw your peeled & chopped carrots into your blender or magic bullet followed by your peeled and sliced red apple, and your quarter-inch long nub of your freshly peeled ginger root. Pour the water and seeds into the blender (you might need to use a spoon to transfer the gooey seeds!) and start blending! Since American history dates back less than 300 years, it’s good to look to other cultures to find food items that have worked for several generations. In this case it’s Indian gooseberry, aka aamla, that is used as a base. The scientific research is starting to back up what drinkers of the tea have been saying for a long time. Studies on rats show that this can help lower blood sugar levels. A huge boost to the body, and the lemon also gives a nice astringent effect as well. Discard the seeds of Amla. Dump in the flesh of Amla, lemon zest, salt and water into you mixer aka juicer. Crush the mint leaves between your palm and add it with lemon pieces to the juice. Raw beets are better for you than the pickled kind you find in the store, and your liver will definitely be thanking you when it starts filtering out this smoothie. There’s also a banana in here so it’s not just beet flavored. In fact the pineapple is going to give this a sweetness that pretty much trumps the beets, and makes it very palatable as well as good for you. Pour the juice into a glass and drink immediately. This is going to be a big boom of citrusy flavor, but that’s not all it contains. A banana is in there to insure that you’re getting potassium into the body, as well as fiber to keep things moving. Your two basic detoxifying organs are the liver and the colon and this seems to appeal to both of them at the same time. Lemons, limes, oranges, and tangerines all mix together to give you all the Vitamin C you could ask for, and to bombard your body with antioxidants as well. Sometimes it’s easy to forget how the body responds to all of these good things for it. Here’s a breakdown: The ginger prepares your body to be more receptive to the other items in this ade. The kale comes through and gives your body a dose of phytonutrients. The lettuce also contains plenty of goodness for you, and the apple needs no introduction. The apple gives this the sweetness it needs to be great tasting and not just a good detox tool. Process romaine lettuce, kale, ginger, apples, and lemon through a juicer. Stir before drinking. Cranberry gets into the title here, but there are plenty of other fruits and ingredients that help get you to your detox goal. Cranberries have long been known for their astringent properties, especially when it comes to the liver. 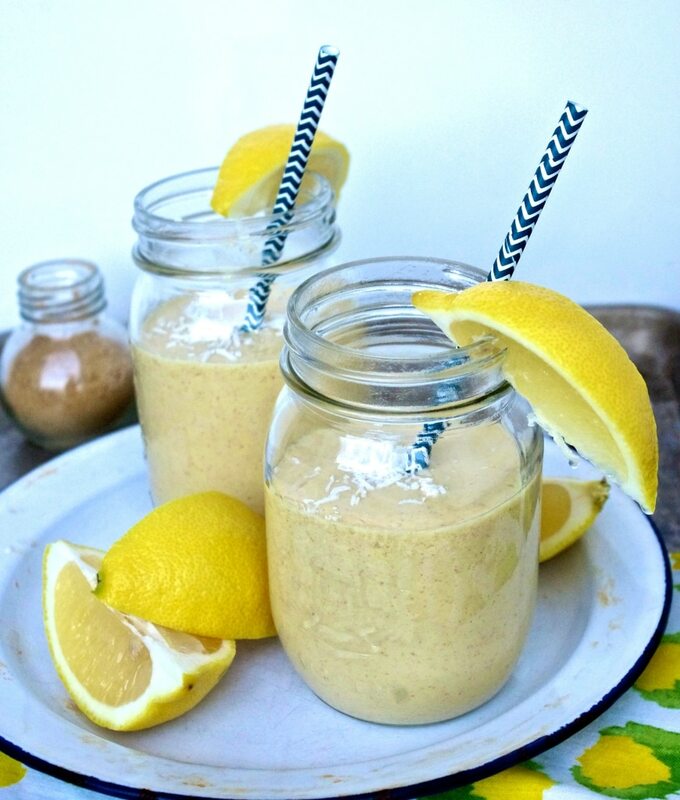 Here they get blended up with pears, apples, and turmeric spice so your body is in for a treat. It’s fascinating the way your body responds to these wholesome foods in such a stark contrast to all of the pre-packaged and fast foods that cause so much harm. Blend ice, if using, and 1 cup of the filtered water together. Then add the spice powders and blend again. Add in all fruits and blend until smooth, adding water as necessary. Check the taste and adjust seasoning to taste. If it seems too thick, add more filtered water and re-blend. Pour into festive glasses of your choice, and enjoy. I like to drink mine with a straw. You can store the smoothie, covered, in the fridge for two days, or freeze any leftover smoothie and enjoy another day. 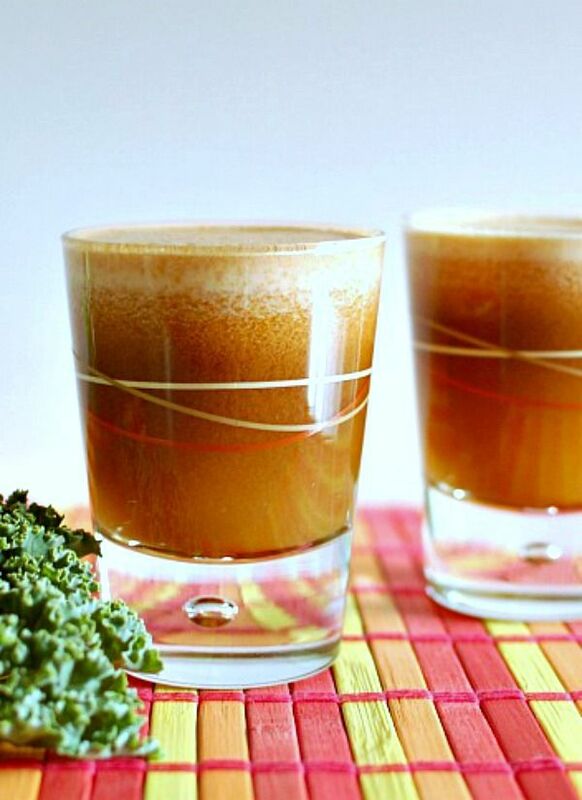 This is a detoxifying drink that you can use each day, rather than a one-off beverage. It’s quite simple, and involves just two mandatory ingredients. They say you should add Apple Cider Vinegar (ACV) with lemon juice to water. They recommend getting a brand of ACV that has “the mother” in it. One of the best brands out there is Bragg, which also happens to be organic. It’s provides a great cleansing to your entire digestive tract. Mix cold water (I use between 16-25 oz), a few ice cubes, 1-2 tbsp apple cider vinegar (the more you use, the more the detox effect but also the more bitter the drink will be), lemon juice of at least one full lemon, a sprinkle of cinnamon and stevia to taste. Drink entire thing first thing in the morning! This cocktail incorporates the use of kombucha, which if you haven’t been exposed to this beverage might be a little off putting at first. But it’s supposed to provide your body with good bacteria that can aid in your digestion. When you improve your digestion you automatically help your body eliminate toxins, because you’re improving one of its routes of elimination. Honey is a great addition for sweetness, and there’s also yogurt that will add even more probiotics. Why make things complicated? It doesn’t take a lot of bells and whistles to help the body detox. 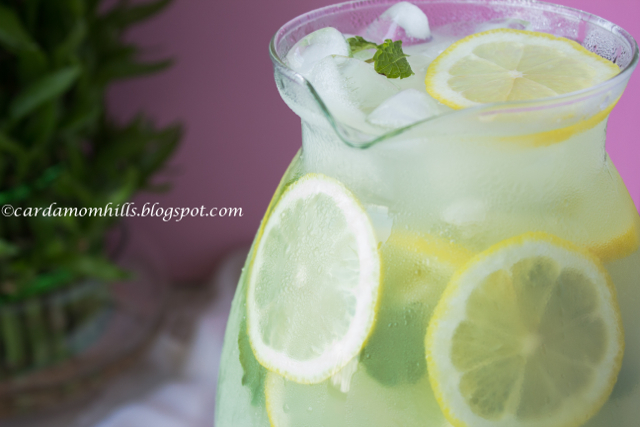 This one lists its ingredients right in the title, it simply combines lemon and ginger with water so your stomach can get ready for the food you’ll eat that day. This is a great drink to enjoy in the morning when you first wake up, about 30 minutes before you eat breakfast. It’s a great idea to do a regular cleansing of the body instead of simply bombarding it with processed foods and letting toxins accumulate. You can decide what sort of program is right for you, as there are many different detox plans available. Some people detox over a long weekend, some for two weeks or longer. It’s up to you to determine what your body needs and what you’re willing to attempt. Good luck!